이덕성(1655-1704)은 본관이 전주(全州)로 1682년 춘당대시에 병과로 급제하였으며 동래부사, 해주목사, 황해도관찰사, 충청감사 등을 역임한 인물이다. 은 높은 오사모에 녹색 단령을 입고 좌안칠분면의 자세로 교의에 앉은 모습이며 배경은 없다. 얼굴은 가는 선묘를 사용했으며 홍조를 표현하고 명암을 살짝 가했다. 육리문은 없으며 수염이 길고 구불거리게 묘사되었다. 단령은 비교적 가늘고 짙지 않은 먹선으로 윤곽과 의습선을 표현하였고 명암을 조금씩 가했다. 쌍학흉배는 밝은 녹색을 바탕으로 단정학과 오색구름을 세필로 화려하게 그렸고, 삽화금대도 정교하게 묘사하였다. 짙은 먹으로 묘사된 교의를 덮고 있는 표범가죽은 가늘고 구불구불한 선으로 사실적으로 그렸다. 정형화된 공신도상으로부터 보다 자연스러운 형식으로 변모하던 18세기 초엽의 정교한 작품으로 중요한 사례이다. 이덕성 관련 고문서는 교서 3점, 유서 3점, 교지·교첩 114점, 시권 1점 등 모두 121점으로 백패와 홍패를 비롯하여 관직을 제수받았을 때의 관련교지가 흩어짐 없이 고스란히 남아 있어 이덕성의 이력사항 및 전기자료로서 사료적인 가치가 있으며 인사·행정에 관한 연구자료가 된다. 또한 그의 몇몇 필적도 왕실유물 및 서예사 자료로서 가치가 높다. Yi Deok-seong (1655-1704) passed the special civil service examination in 1682 and served in various public offices including county magistrate of Dongnae and Haeju and governor of Hwanghae-do and Chungcheong-do Provinces. 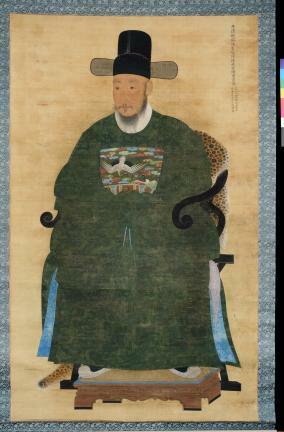 In this portrait he is dressed in a green ceremonial robe and a black silk hat, and is seated on a chair with a three-quarter view from the left against a plain background. The face is described with thin lines and slight contrast of light and dark but without paying attention to skin texture. The curly beard is carefully described. The robe is defined with light ink lines with slight contrast of light and dark along the folds. The flying cranes and clouds on the colorful chest emblem are rendered with a fine brush, as is the gold-ornamented sash. The tiger skin covering the chair is realistically described with thin curvy lines. The overall style represents transition from the portraits of meritorious subjects to a more natural portrait style, which occurred in the early part of the 18th century. A total of 121 related relics useful for studying Yi’s life and official career are handed down along with this portrait. They include three royal documents, three royal edicts, 114 letters of appointment and one examination paper. These are also valuable for research in personnel and public administration in the Joseon Dynasty. Some have high value as research material for royal relics and calligraphy styles.